Create bootable USB drives or SD cards with this easy-to-use media-creation tool. Bootable USB drives are a great way to try out a new Linux distribution to see if you like it before you install. While some Linux distributions, like Fedora, make it easy to create bootable media, most others provide the ISOs or image files and leave the media creation decisions up to the user. There's always the option to use dd to create media on the command line—but let's face it, even for the most experienced user, that's still a pain. There are other utilities—like UnetBootIn, Disk Utility on MacOS, and Win32DiskImager on Windows—that create bootable USBs. About 18 months ago, I came upon Etcher.io, a great open source project that allows easy and foolproof media creation on Linux, Windows, or MacOS. 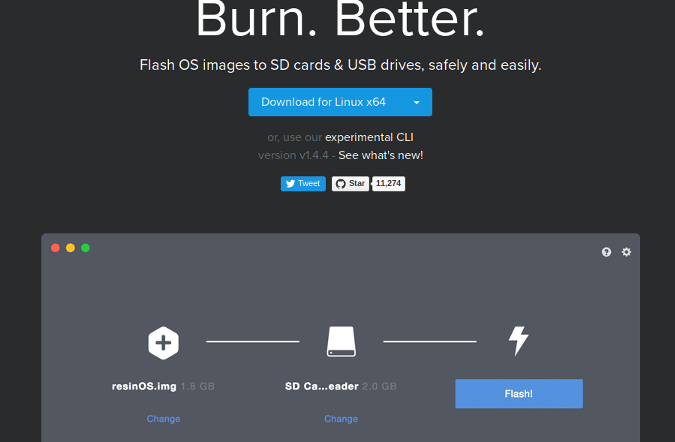 Etcher.io has become my "go-to" application for creating bootable media for Linux. I can easily download ISO or IMG files and burn them to flash drives and SD cards. It's an open source project licensed under Apache 2.0, and the source code is available on GitHub. Go to the Etcher.io website and click on the download link for your operating system—32- or 64-bit Linux, 32- or 64-bit Windows, or MacOS. Etcher provides great instructions in its GitHub repository for adding Etcher to your collection of Linux utilities. In addition to creating bootable images for Ubuntu, EndlessOS, and other flavors of Linux, I have used Etcher to create SD card images for the Raspberry Pi. Here's how to create bootable media. First, download to your computer the ISO or image you want to use. Then, launch Etcher and insert your USB or SD card into the computer. Click on Select Image. In this example, I want to create a bootable USB drive to install Ubermix on a new computer. Once I have selected my Ubermix image file and inserted my USB drive into the computer, Etcher.io "sees" the drive, and I can begin the process of installing Ubermix on my USB. Once I click on Flash, the installation process begins. The time required depends on the image's size. After the image is installed on the drive, the software verifies the installation; at the end, a banner announces my media creation is complete. If you need help with Etcher, contact the community through its Discourse forum. Etcher is very easy to use, and it has replaced all my other media creation tools because none of them do the job as easily or as well as Etcher. Don Watkins - Educator, education technology specialist, entrepreneur, open source advocate. M.A. in Educational Psychology, MSED in Educational Leadership, Linux system administrator, CCNA, virtualization using Virtual Box. Follow me at @Don_Watkins . I've never tried to create a bootable SD card with Etcher. Or, to be honest, ever thought about it. Might have to give it a try. i'm burning the latest Raspberry Pi image right now with it. I used it twice yesterday to put Knoppix and LinuxLite on USB drives. You're welcome. It's really great software. Did not work in Mint Xfce4 19. Did not work on Linux mint 18.1 Serena on 27.11.18 (OK it's old kit but that's why I need need Etcher so's I can upgrade it). You might try the App Image and execute from the command line. That’s worked for me. It is an excellent software. But why go through all that to install it? Download it and run it. I actually used it as an App image before I installed it on Ubuntu 16.04 and 18.04. It works well that way too. I've burned one SD card this week for Raspberry Pi and almost 10 USB drives with live Linux distros on them for class I'm teaching. I love this software. Thank you Watkins for the post. Have been looking for software like this, especially as an Appimage. First: FORGIVE ME FOR MY ENGLISH! Now I need to boot a live on a Mac. My question is: if I make a bootable usb on Linux using Etcher, is it bootable on a Mac? In other words, if I want to boot a Linux Distro on Mac do I need to use Etcher on a Mac or it is the same if I create it on Linux? Yes, this works using etcher. It is a great tool. The platform doesn't matter on etcher, what matters is the media that you are flashing. It appears the RPM repository is not working.